Some months ago, I decided I wanted to make a bag with lots of pockets. The Talkin' Tuesdays crowd suggested Amy Butler's Everything Bag from her book, Little Stitches for Little Ones. 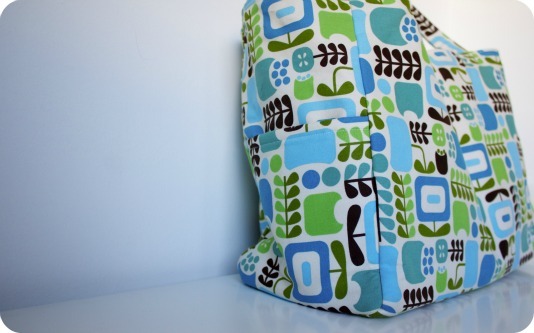 It's intended to be a diaper bag, so it's got pockets aplenty. This is by far the biggest and most complicated bag I've made, so I wanted to share the down and dirty details. I'll give you the good news first. 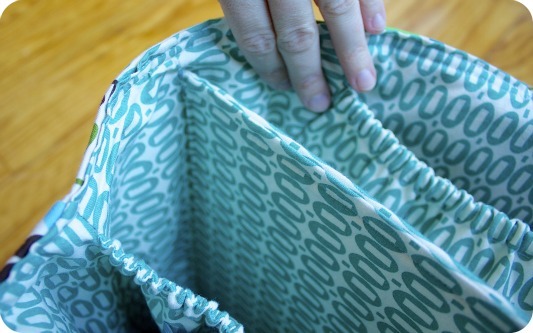 - Four awesome pleated and elasticized interior pockets. - It stands on its own thanks to a sturdy double Peltex bottom. - The double Peltex divider keeps papers flat and gives you the option of putting your computer or iPad on either side without it taking up the bag's whole interior. - The two exterior pockets on the end panels are great for stashing your phone, kleenex pouches, keys, or small chargers and cables. - Interpreting the pattern was a serious challenge. I literally stared at one section for an hour trying to figure out what pieces I was supposed to be working with next. Unfortunately, this pattern refers to the same pieces of fabric by different names in different sections of the pattern. If they would have been consistent about naming and gone to the trouble of printing the extra words, it would have been much clearer. - There were only three illustrations to help explain the assembly, and they didn't do much to enhance the written instructions. It would have been helpful to have an illustration labeling all of the different parts of the bag so you could orient yourself during cutting and assembly. - Lots of Pellon SF101 interfacing, Fusible Fleece, and some Peltex. Use your coupons, people. - Fusing: I kept a spray bottle of water handy. My pressing cloth was an old t-shirt that Mr. Pins was going to toss. I just sprayed the t-shirt with water and parked my steamy iron on top to fuse everything. Having my watch helped so I could tell whether or not I'd waited the whole ten seconds for the glue to melt and bond. Giving it the whole ten seconds definitely helped the fleece fuse better. I'm glad I used the fusible fleece instead of substituting batting, though. - Input from the web: Lots of bloggers mentioned it was impossible to make the final edge stitching around the top of the bag look nice, because the divider came up to the top of the bag. I boldly cut an inch off of my Peltex divider pieces and an inch off the top of the lining divider pieces. It didn't change the construction, so I figured it would be ok. I'm so glad I did this. Doing the final edge stitching was still hard, but I could go all the way around the bag. - Straps: I fused two pieces of SF101 interfacing to the back of the straps, and I made the straps 26" long instead of 18". - Shortened the center divider by an inch. 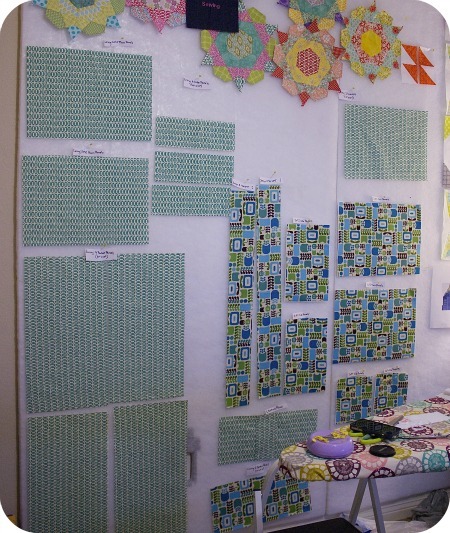 - The fabric I used on the exterior is from the Piccadilly Collection by Sparky & Marie for Quilting Treasures. Alas, it's not licensed for use in items made from it. The fabric is heavier than quilting cotton, but it's pretty light on the home dec scale that the pattern called for. 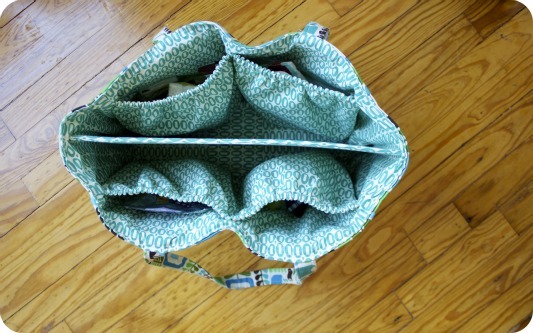 Using a heavier fabric would make for a crazy sturdy bag. 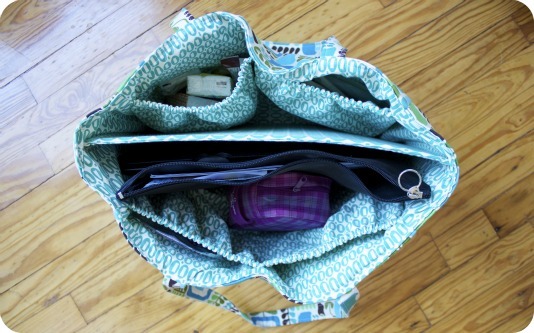 - I used 14" of elastic for my pockets, and I'm glad I did. - I might add two Peltex dividers sewn into the sides to make an exclusive loose paper section. - It could be fun to shrink the pattern down a smidge. A more everyday size with all of these pockets would be a dream. - I think a laminate version would be awesome. - I wouldn't try to make this bag in one day again. Definitely plan for two full days of work at the least. I wanted to finish it before Sewing Summit, and I stayed up too late. Then I was up late packing the next night. I paid for those shenanigans for days. - I'd like to try straight line quilting on the exterior panels to give it some texture. - I think substituting Pellon 809 for the SF101 would give it more strength and structure without adding much weight. I took extensive notes while trying to interpret the pattern. If you're trying to make this bag and you get lost, email me. I'd be happy to try to help if you're stuck. In the end, I'm so glad I made this bag. Jeni Baker was sweet to compliment me on it at Sewing Summit, and I had folks ask about it in the airport and at Quilt Market. Ahh yes, the crap AB pattern instructions syndrome... Still, you overcame it fabulously! It does make you wonder how AB has become so stellar given how terrible her bag patterns are! 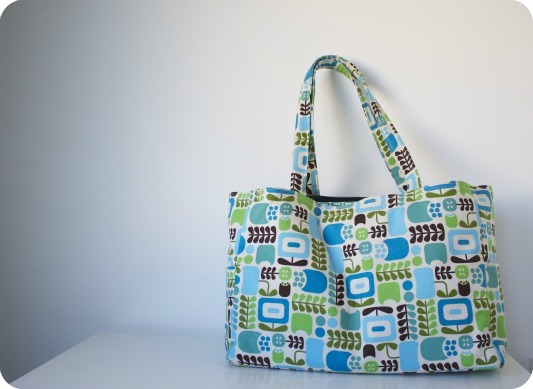 Well done on overcoming all of the drawbacks of working from an AB pattern to make such a great bag!